Note: Avalon Aviary is at this time not breeding Yellow Shouldered Amazons due to the untimely death of the male of our pair. We are actively seeking a replacement, and will resume breeding when a suitable one is obtained. Yellow Shouldered Amazons, Amazona barbadensis, are a smaller, fairly rare species of Amazon parrot that is mostly green with varying amounts of yellow on the face and bend of the wings. They have pale yellow to white feathers on the front of their foreheads, and these pale feathers have deep coral color at their roots. They have longer tails in proportion to their body size than most Amazon parrots. The gorgeous outer tail feathers of Yellow Shouldered Amazons have blue, red, green and also some violet in them. Yellow Shoulders are native to a small region on the coast and offshore islands of Venezuela. 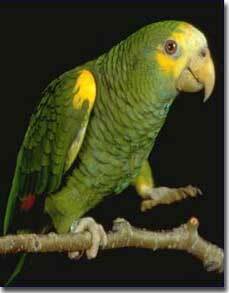 Yellow Shouldered Amazons are a smaller Amazon parrot at 12 inches head to tail. They weigh approximately 270 grams. These Amazons tend to be a sweeter, calmer species. They tend to accept more physical attention than many birds in this genus. They are quieter than the other species of Amazons. Because they are not as vocal, they tend not to pick up as extensive a vocabulary as many of their larger cousins. They are inquisitive and interested in what is going on, and love to play with toys. Most of them are very comical and outgoing. Some even enjoy rolling on their backs, which is very “unAmazon-like”. Yellow Shouldered Amazons tend not to be as volatile during breeding season in the early spring. Watching their behavior and body language closely you may see some sign of their raging seasonal hormones. Yellow Shouldered Amazons are a sweet, fun, energetic, active species of Amazon and tend to be much calmer and gentler than some of the bigger species. They make wonderful companions and bring much joy to their families.